Fast paced and amazing colors, Subdivision Infinity looks amazing. Check out the trailer below because it will probably do more justice than me going on and on about it! 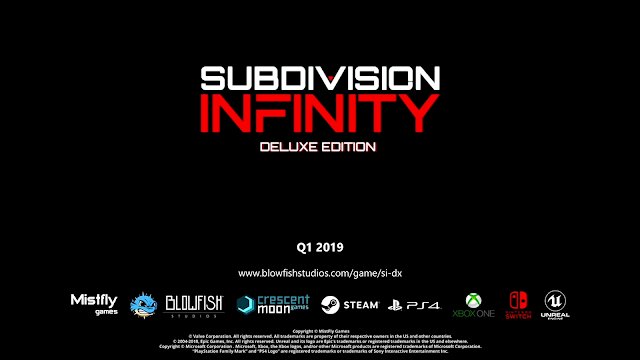 "Exploring outer space in Subdivision Infinity DX is an absolute blast," said Ben Lee, founder, Blowfish Studios. "We look forward to allowing players to live out their sci-fi fantasies in the game when it launches for PC and consoles early next year." Blowfish Studios will showcase Subdivision Infinity DX at PAX Aus 2018 alongside other titles from the publisher's catalogue. The game will support English and Russian language options. To learn more about Subdivision Infinity DX, please visit the game's official webpage.